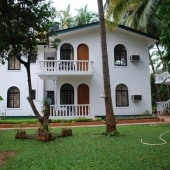 Albuquerque Holiday Villas are located in the heart of Candolim and less than 500 meters from the beach. These self-catering apartments and suites are constructed in the Portuguese style and are surrounded by lush and well tended gardens. There is also a swimming pool with comfortable sunbeds to relax in this peaceful and setting. These garden view rooms are air-conditioned and include cable TV, refrigerator, seating area and a balcony. The private bathrooms have hot and cold shower and towels. Free Wi-Fi access is available throughout the property. Albuquerque Holiday Villas offers several services such as laundry and currency exchange and a tour desk. Free parking is available on site. There is no on site restaurant however, complimentary breakfast is offered in the breakfast room. 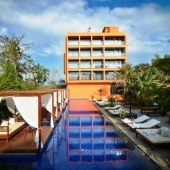 The Villas are within walking distance to restaurants and markets. There are three Deluxe Rooms, in an independent cottage with garden view and spacious private balconies. All rooms have cable television, fridge, tea/coffee maker, telephone and ceiling fans. These rooms are air conditioned and have en-suite bathrooms with hot cold water. Two rooms one on the ground and another on the first floor with separate entrance. The Deluxe Suites, are spacious with six rooms in an independent cottage surrounded by the gardens. The deluxe suites have a sitting room, kitchenette with basic cooking utensils, a comfortable double-bed and ensuite bathroom. The private balconies overlook the garden. All the deluxe suites are air conditioned. There are three private units per floor and the suites can be connected to accommodate a group or family. These deluxe suites have ceiling fans, Cable TV, large fridge, and telephone. The Superior Suites, are located in an independent cottage with one suite on the main floor and one on the top floor, each with a spectacular view. Each Superior Suite has a lounge, bedroom with a large double bed with en suite bathroom. There is a kitchen with fridge, toaster, kettle, microwave and utensils. The rooms have AC with TV in the sitting room and a TV in the bedroom. The Family Suites are in the heritage family house. These three suites are on the ground floor and can be rented individually or three suites for a group. The private balconies face the gardens. The suites can be inter-connected to each other through the living room doors of the respective suite. These suites have a living room and bedroom with a double bed and ensuite bathroom.. All suites have AC in the bedroom, fans, TV, a large fridge, kettle, and phone. The living room also has a sofa bed to accommodate 2 additional guests. 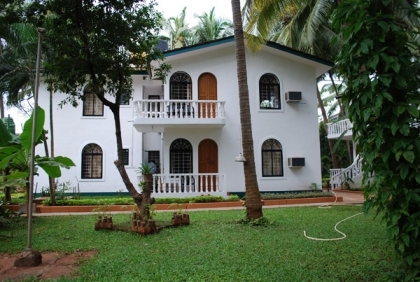 Albuquerque Holiday Villas, Goa is located approximately 200 meters from Candolim, Calangute beach is only a 10 min walk away. Baga Beach 2 km. Thivim Train Station – 21 km. Dabolim International Airport, Goa – 38 km. Within a 15 km radius of Candolim Beach is Calangute beach, Baga beach, Anjuna beach, and Vagator beach. Nearby Attractions: Anjuna Market - 10 km, Arpora Saturday Night Market - 7 km, Old Goa - 17 km and Panjim - 14 km. Albuquerque Holiday Villas does not have a restaurant onsite, however they provide breakfast for room guests. Newton's - north Goa's biggest supermarket is 350 meters from the resort. Popular restaurants nearby - Burmese restaurant Bomra's is 900 meters away, Wok & Roll - 2.5 km, amd Tuscany Gardens 1.5 km. Room rates are inclusive of Free Breakfast (Tax not included).